While I’ve heard LinkedIn called “Facebook for dinosaurs,” I believe its focus on the professional marketplace makes it both a superior venue for advertisers and for professional networkers (in the sense of professional people networking, not people who network for a living who are called “bankers”). As I pointed out here, responding to “who’s got a better body?” when looking at a picture of a board member and a customer is not a great thing. I like Facebook, don’t get me wrong (it’s 100 times better than MySpace) and I do believe there is real power in leveraging Facebook as a platform. But I also believe in focus. While Facebook started with college students, owned that market, and is now one-hop expanding into the broader “everyone” market, LinkedIn started with professionals and stayed there. 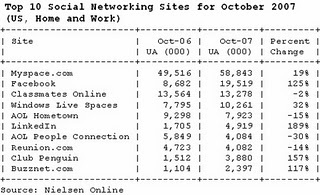 While I do wonder if Facebook is over-expanding too quickly (e.g., why not get high schools, then some segment of businesses, building out systematically), I do believe there is a potential opportunity for some company to “own the graph” and that’s clearly what Facebook is pursuing — but at the cost of serving each of the segments in an appropriate way. That said, time is on their side because once you hook the audience in high school or college, they inevitably age into young professionals. Basically, you own the audience until you irritate them or until they find a better tool for the task. For example, will current high schoolers think of Facebook as something so personal/friend-y that it’s not appropriate for work networking? It’s possible. By the way, I think LinkedIn has a 0% chance of owning the graph when it comes to high schoolers and college students, and they are at something of a time disadvantage when it comes to audience life cycle. So I’d say strategically the odds are in LinkedIn’s favor if they aggressively evolve their offering to best serve the needs of the professional segment. How might they do that? Enable LinkedIn apps so the community can create apps of practical business value. I don’t think I’ve heard much from there here. Work to avoid network dilution — if everybody says yes to every network request then the graph loses value. Help people understand who they should and shouldn’t link to. Help them ignore requests. Help them prune and clean the graph. Enable a clean transition / migration from Facebook and MySpace for young professionals as they grow up. Basically, carve out a niche in social networking for professionals. Until Facebook understands roles and puts a real focus on serving professionals, I think LinkedIn has a great chance to be the leader in the segment. But more and better execution is needed. This entry was posted in social networking, Strategy. Bookmark the permalink. I’ve found that the people I connect with on Facebook have discovered that the same hotmail/gmail/yahoo contact importers that make Facebook so viral are also available on LinkedIn. So people who are linking to me on Facebook are also linking to me on LinkedIn a few days later. I still value a Facebook friend a lot more highly than a LinkedIn connection. There is a huge amount of interaction going on in Facebook with messages and applications and I am getting little interaction out of LinkedIn other than the odd question.